Too much drought in Summer 2003 made life tough, except where there is a convenient supply of water dishes to wash down the cereal. But the heavy snows of Winter 2002 - 2003 made it a long night underground; many many new binks appeared, only to be washed out by the heavy rains this year -- heaviest in a hundred years! 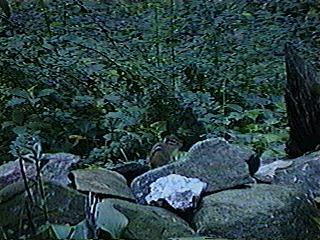 Chipmunks have ways of burrowing that keep their dens dry in the rain, but this year must be particulary difficult for them. In the other hand, the rain has made for a lush woods, so there's bound to be a bumper crop of acorns and hickory nuts to gather later, to support yet another generation of rock-runners. It has been very mild, allowing daily sortées from temperature-controlled burrows into the open garden. With crows and red-tailed hawks more interested in the subsatntial meal of a squirrel, the population seems stable and healthy. Some Chasing foretells of broods in Spring. Not much action this year, though there is now another Binkie Underlaurel. She is currently, (July) holed up with young probably on the way, or here. The rainy spring and summer of 2000 is legend in the New England area. Observations of wildlife were curtailed, restricted to narrow days of clear weather. One of the young of the wintering over took up residence again in the Underlaurel hill; a shy but cheeky lady Binkie. He's survived the Summer, Fall, and Winter of 1998, and the Spring of 1999. Yes, he's still around, Rocky the Irrascible. Though showing lots of grey in his fur, he can still chase the young'uns away from his food supplier (moi) and make sure to get the best pieces of sandwich. There's a lithsome Wallette he has his eyes on, so there may be the pitter pitter of little claws someweek. There are stirrings in the walls and gardens, as the new year above ground begins. There are several missing personnel, which may be attributed to the pair of hawks that have taken up residence nearby. Squirrel-tail soup, anyone? So, Wally survived his disorder and now rules his Wall well. Binkie has settled into the front walk, and has opened an entry in the midst of the paving stones. Watch your step, and did you remember your toll? Fall is coming on, and there are frantic efforts to cache in again on the nutty bounty of the oaks. No young visible, but maybe later in the season we'll see some new friskers about the place. OK so spring was a bust around here, wet and cool; good for foliage and flora but not too good for fauna. One of the Underlaurels seems to have The Mange on the cheeks, rather distressing if you're a chipmunk; and no, no vet will be called in. They're cute, but come on.... Can't tell which kid it is, but since it lives in a bit of stone wall it would be Wally. Binkie is installed at the front of the house, and demands a toll (-house cookie, please) of all who use her walkway. Savaged by rampant 'munks! Held Hostage by famished rodents! -- Film at 11! Their constant vigilance is actually very positive, since any intruder in their econiche is driven out -- other ground-dwelling rodents of the verminaceous sort (names beginning with R and M and ending with t and e) are driven out. Rabbits are ok though, and have been seen romping after each other on the lawns and in the woods. It is spring & summer's nearly here, hey nonny, ya know. The Fall was a rich harvest of acorns, and lots of maple seeds; Binkette got the old homestead, Underlaurels-by-Rockgarden, and proceeded to fend off invaders, furred, feathered, friend, and family alike. The Crowes got Runtly, who never had much gumption anyway; though his contemplative musings on the stump were most enlightening. The others are out in the woods under root and limb. Because of the cold, none of the Underlaurels are available for comment now and more news must wait for spring.